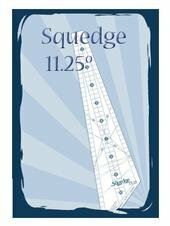 A Squedge is a squared wedge. Wedges make circles, but Squedges make squares. (16 1/2" unfinished) with 32 Squedge pieces. Use the precise slots for marking the inner shorter pieces.